I was discussing Henry Lawson’s poem Past Carin’ with someone yesterday and looked for it on Bytes, only to find that I had never reposted it from the email days. Bytes was originally an email that was sent to a small group of friends but it grew so large that my daughter turned it into a blog. I reposted quite a number of the emails on the blog but overlooked Past Carin’. Here it is, from December 2009. . . Watching the DVD series of the old Oz classic "All The Rivers Run", I came to the episode where the steam paddler "Philadelphia" is stranded up the Murray because of drought and low water. Whilst so stranded, the people of the boat meet with a farmer, Mr Slope, and his wife. They live in a small hut in a barren landscape. Mrs Slope explains that all the trees died when the river flooded and the soil went sour. It is clear that his wife has been made hard by the land and the conditions in which she lives, it is almost as though she has had the gentleness, feeling and emotion sucked out of her by the land. She later shows Sigrid Thornton the graves of her two children. The scenes were so close to Henry Lawson's poem "Past Carin' " that he could have been writing about her. Perhaps the scriptwriters took their story from the poem. The poem and some biographical notes about Henry Lawson follow. 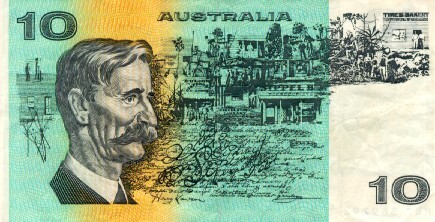 It’s a sad thing when Henry Lawson (1867-1922) is known to the younger generations today only as “the dude on the ten dollar note”. One of Australia’s greatest poets and fiction writers, he is also credited with being the first poet to capture the Australian way of life. 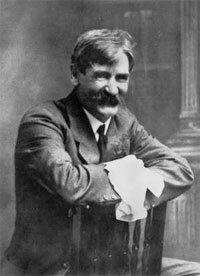 Born of a impoverished family on the goldfields, Henry Lawson had a poor education but was supplied large numbers of books by his mother. Shy and sensitive, he was unlike the other bush boys, so much so that even his mother thought him strange. At age nine an ear infection left him partially deaf; by age fourteen he was wholly deaf. As a result he was tormented by the other school children, making him even more of a loner, although it also instilled a keen observation of people. Whilst working at various jobs he began writing poetry, eventually becoming published in The Bulletin. Lawson’s first published poem was in 1888; in 1892 the magazine paid for an inland trip. There he experienced the hardships and harsh reality of life in the drought-affected outback. Those experiences were reflected in his poems and in fiction such as “The Drover’s Wife”. His depictions of the grim reality of outback life was far removed from the romantic idyll depicted in Banjo Patterson’s poetry. Where Patterson wrote of brave horsemen and beautiful scenery, Lawson wrote about the loneliness, hardship and grim desolation of life in the bush. His poem “Past Carin’” and the short story “The Drover’s Wife” have been described as the first accurate depictions of the Australian way of life. Lawson’s later life was as sad as his earlier years. A marriage which produced two children was unhappy and failed; he became an alcoholic and was frequently seen begging, often at the Circular Quay turnstiles. He received gaol terms for drunkenness and failure to pay alimony and not surprisingly suffered from depression. A friendship between Lawson and the elderly Mrs Isabella Byers resulted in the alleviation of some of his difficulties. Herself a poet, she regarded Lawson as Australia’s greatest living poet and assisted him in his dealings with publishers, establishing contact with his children and seeing him through his mental and alcohol problems. The friendship lasted 20 years until his death in 1922 of a cerebral haemorrhage. He was buried in Waverly Cemetery, the first person to be granted a NSW state funeral. “Past Carin’” is a sad and grim description of outback life, harshly descriptive of its hardships, loneliness and heartbreaks. One commentator has described it as “unremitting bleakness so sympathetically portrayed… The strong, determined woman finally beaten by her lot.” She wants to be “past carin’” because it will stop the pain whenever the things she loves are cruelly snatched from her by the harsh Australian land and its hardships. Whereas the various stanzas have her declaring that she is now past caring, the last stanza shows that she is not. Although her life in the bush has been one of grief, loss, desolation, loneliness and despair, she still cares, quite a deal, but she wishes she didn’t. Since then -- and I'm past carin'. Have grown to be past carin'. As she says, the girl who cared was the girl who waited long ago. For I have gone past carin'. I've got to be past carin'. I've come to be past carin'. Were awful, wild -- despairin'! Since then, and I'm past carin'. Has lived to be past carin'. A dull and empty achin'. Beyond all signs of carin'.